Virgen del Castillo, Immaculate Conception is a Marian devotion is venerated as patron saint in the town of Yecla ( Murcia , Spain ). His sanctuary is a place of pilgrimage not only for yeclanos, but also for the people of all their region and even the rest of the region and neighboring provinces. The name of Virgen del Castillo , though official, is but the popular name with which the population has renamed its patron to receive worship at the shrine of the Castle , named for being just next to the medieval fortress that crowns the hill on which the town sits. The invocation actually corresponds to the Immaculate Conception , venerated in that temple since time immemorial. It documented the existence in that spot of a Mozarabic church, dedicated to Santa Maria, which even became parish until the mid- sixteenth century . But the event that marked the significance of the old sanctuary would occur during the reign of Philip IV , when a group of yeclanos led by Captain Martin Soriano Zaplana returns to town after fighting French troops who had invaded Catalonia . Yecla fighters return without having suffered any casualties, a fact interpreted as a miracle and they decide to go up to the Hermitage Castle in thanksgiving. That act constituted an event for the city, which has since see in the image of Our Lady of the Castle a symbol of protection. The site where the Virgin is worshiped has undergone numerous reconstructions and renovations throughout its history, dating back to the current building XIX century . Neither the size that is venerated today is the original, since it disappeared in the Spanish Civil War ; It is a replica made by Miguel Torregrosa in 1941 along the lines of the original, which was canonically crowned in 1954 . The July 17, 1642, during the War of Catalonia, 61 yeclanos are summoned to come to the front to defend the unity and integrity of the country led by Martin Soriano Zaplana. The camp is situated in the land of Vinaros, specifically in the chapel of San Sebastian. The favorable development of the race means that after half a year in the barracks, do not become involved in the front and can return to the villa without any casualties or wounded. The religious sentiment of those 61 men led them to climb the Santuario del Castillo where worship was given to Our Lady of the Incarnation, already known as Virgen del Castillo, to give thanks for the return of the men. Not being satisfied with this Thanksgiving, remember down every year for a few days, the image of the Virgin to the Church of the Assumption. These reductions were accompanied Virgin musket salute, to remember what happened in the contend, having no fixed date yet, it has to be held in December, January or August. In 1691 the Brotherhood of the Virgin was founded, as the body responsible for the festivities, whose main purpose was to acquire an image of the Virgin by a very similar to the Franciscan now. During the War of Succession, parties receive their first regulation establishing ,, celebrations in the month of December each year, with the drop on the 7th, the feast day 8, day of the Immaculate Conception and the following Sunday the rise , and in 1793 established the requirement that the Virgin remained in the village for at least nine days to conduct a Solemn Novena. The most important of the eighteenth century for the holidays, came later that with the creation of the current "ordinances" which meet the legal provisions which organize and regulate each and every one of the acts of the parties, being sorted in a positive way by the illustrated authorities. Already in the nineteenth century, preserving the established some guidelines for improvement are emerging acts. A half-century, November 30, 1868, it is carried out one of the most important events in the history of the town of Yecla, is inaugurated and blessed the present Basilica of the Immaculate, and is determined to be in this temple where the cults and religious ceremonies take place in honor of the patron. By the end of centuries two institutions are created around the Feast of the Virgin: The Brotherhood of the Virgin refounded in charge of the cultural events of the Festival and the former board of stewards to organize major events. During these years, thanks to the efforts of numerous personalities of the city, backed by the city, the Festival of the Virgin received a big boost with improvements, for example, at the Shrine of the Castle, with the construction of the chapel and adequacy of esplanade and promenade; performing a processional float and valuable crown of gold and precious stones and valuable blue robe embroidered in gold thread by hand. The twentieth century witnessed an unprecedented boost to our celebrations of the Virgin, with which you try to continue. One of the most important in the history of the People's Party José Esteban Diaz, who arrives in Yecla as archpriest of the Basilica of the Immaculate. Will be responsible for formally constitute the current Butlers Association, organizer of the Festival and as a symbol of unity of all yeclanos. It is also the promoter of the Canonical Coronation, but when everything was shining splendor came the sad events of the Spanish Civil War, which would be responsible for paralyzing the Festival for several years and end with the traditions of a people. Note the fateful afternoon of March 16, 1936, where yeclanos watched as the flames ran all the work of centuries, with the burning of all the churches of the city, as well as most existing iconography images, including the image of the Patroness of Yecla. 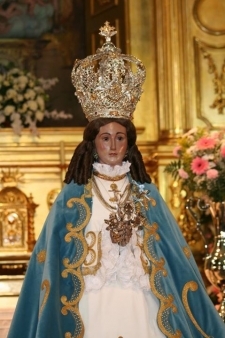 After several devastating years, the town of Yecla does not surrender, and even if possible, come out stronger from the fight, and again, led by the priest of the town, José Esteban charge a new size similar to Virgin before the sculptor Miguel Torregrosa and rebuilding damaged temples. It's also got out again the project of the Canonical Coronation of the Virgin, who after many years of work and effort was achieved through the work of Pope Pius XII, it was granted the Virgen del Castillo was crowned. On December 7, 1954, Yecla seen as a dream is achieved as that date will be marked in the history of the City, for the coronation ceremony is held. Thereafter, the parties have overcome year after year, establishing new acts like the great Gift of flowers, in the afternoon of December 7 and other acts which give splendor to the celebrations. Creating more teams will also get up to the current 15, are having a very important development activity festive paper. Notably, in recent decades, the work of improving and adapting all acts, keeping intact the ritual of the holidays. In 2002 the Declaration of National Tourist Interest is achieved, key to the development and projection in the rest of Spain and in 2008 the party declared as Intangible Asset of Cultural Interest, which is key to maintain the tradition and roots of these festivals. Today the Festival of the Virgin are defined as the most important in the city, with a high turnout of people both as cities Yecla in the region and in Spain, maintaining the tradition of the former military boasted in appropriate parties to today. Favor: Petition to make the City squads representing yeclano army to begin the festivities taking place on day 5. Fifteen rockets are launched from the Castle, answered by as many from the Plaza Mayor, are hoisted while the Flags on the balcony of the town hall and flip all the bells of the city. Kiss Flag: On 6 also serves as a prelude to the great days of celebration, in this case with an act of exaltation to the yeclana teaches. The Alborada: The dawn of day 7 is linked to the roar of thousands of muskets , with a general appeals to the population to begin the ascent to the sanctuary. Offering: On the afternoon of 7 as one of the most mass events, for anyone who participates desired, in pairs, the men in the garb of "tiraor" and the ladies with tile and mantilla. After a parade through the city streets, you come to the Basilica where he holds the offering of flowers to the Virgin. The Descent: massive pilgrimage to the image of the Virgin is transferred to the city from the Castle, celebrating their name day on it. The size remains in the Basilica of the Immaculate from the 7th until his return to the sanctuary. Lady Day: The 8 December is the big day, celebrated High Mass in the Basilica and a solemn procession with the statue. More than five hundred musketeers accompany the Immaculate in the parade, discharging shots in his honor and flooding throughout the city again gunpowder. Special mention the solemn entrance of the temple patron, when it acquired the so-called singular role playing or waving of the flag that is traditionally performed before the throne. The Minerva: In the morning of the climb, the Blessed Sacrament in their custody, bless the soldiers and the people in the atrium of the Basilica in the middle and high chairs muskets the butler before playing flag. Day Rise: Pilgrimage back to Castillo, constituting the end of the festivities. It takes place after the conclusion of a novena prolonging the stay of the employer in the city until mid-December. Participants are divided into groups of teams: Alabarderos, Alborada, Arabi, Atrium of the Immaculate, Captain Mora, Captain Flag I Zaplana, Zaplana I Captain Cane, Cane Castle III, El Paso de la Bandera, La Purisima , the rear, Rear The Moon , Mary Immaculate, Minerva, Vinaroz, Virgen del Castillo, tambier can participate freely, without belonging to any squad.